I couldn’t properly tell you if this is the product of a good mood or a bad one. I work best when my heart feels brilliant; gloom separates me from ultramarine and crimson red as surely as a broken hand would. But sometimes I overdo it, too. Oh, well, it was fun, and I’m sure someone will make a good collage out of it on Polyvore someday! Add some bunny ears on a headband and it’d be perfect! Although it’s not the type of thing I would wear, I like it. The contrast kind of grabs your eyes. How did you make the fabric look like it was gathered? This is my favorite yet, I love color and your dress got all the color without overwhelming me. Awesome Job! I really like this. It’s so happy, it made me feel a little better. I just found out my adviser gave me the wrong info for a class I’m taking in college, so now I’m stuck in a class I hate. Maybe I should put this dress on my bulletin board to make me happy. Pretty! May I ask which colors you used for the rainbow skirt? Wow, perfect for this rainy night. Of course, I am a Scorpio and we do love color. Outside the snow is piling up here, so this dress made me grin. Perfect for this sort of dark deary weather. Janani, it’s kind of hard to describe – in a way this is sort of what I do when I’m almost on autopilot. For this, I started out with a layer of a light color – for example, the red base is Poppy Red – lightly applied all over the area (not hard at all, you still see lots of the white). Then Crimson Red in thin lines over it: more at the top and thickly around the sides, and just kind of all over the place in the middle of the red part. Then Tuscan Red at the edges and top, and over the Crimson Red lines, and the colorless blender to smooth it all together and especially bring out the Poppy Red. Then there’s just a little black between each section and at the very top, under the bodice part. I don’t know if that makes sense? I already put away the pencils, I forget which colors exactly I used. Betty, let’s see if I can remember… Poppy Red, Crimson Red and Tuscan Red; Spring Green, Kelly Green and Dark Green; Light Cerulean Blue, Sky Blue Light and Indigo Blue; Parma Violet, Violet and Black Grape; Sunburst Yellow, Goldenrod and ???? I believe Canary Yellow, could be Lemon Yellow too; Pumpkin Orange, Yellowed Orange and ??? – I think Pale Vermillion, I like that one so it’s probably the one I used. Black, French Grey 90, French Grey 50 (I think). Hurrah for a splash of color! It’s very bleak tan around here, not even crisp snow for cheer, so I’m happy to see this one!! Woah! So nice after a day of rain. The storm passed right north of us (as in, half hour away) so all we had all day is rain and now it’s all freezing. Fingers crossed for no school. My eyes went all googly when I saw that gown. I aboslutely LOVE it Liana! If you want a good example of how Liana does her gathering effect check out her colourless blender tutorial. The breakdown shows the steps she used to achieve her effects. I learned a lot from that tutorial. Awesome. Very well done. I like the colors and the gathers. We are in the midst of a blizzard, with 35 mph winds, and two feet of snow. 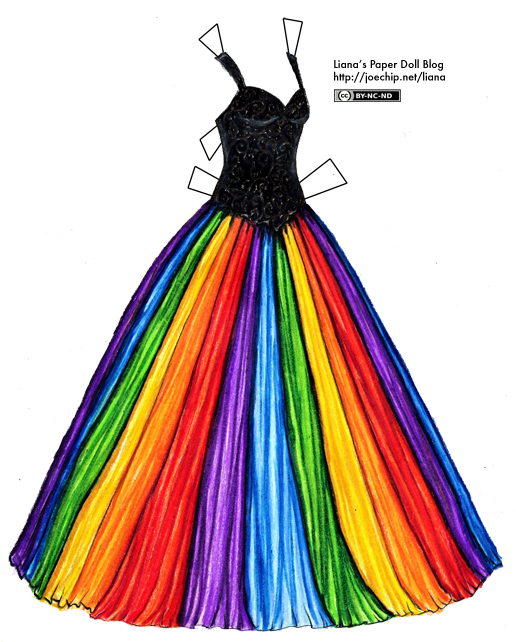 Everything is shut down and everyone is snow bound–your lovely rainbow of a dress could not have come at a better time! I shall have to print out several so that each of my granddaughters paperdolls can have one! I… would wear this. I wouldn’t even need an excuse, I’d just wear it out to the grocery or walking the dog. “Geez, lady, what’s the occasion?” “IT’S WEDNESDAY, ISN’T THAT ENOUGH?” This is why I am not allowed within a hundred miles of a frock shop. It’s beautiful!! I would love to wear your dress! Oooooooo Liana!!! This is my favorite yet! I’m not kidding! When I got the website I think I almost went crazy! I LOVE it!!! Wow…when I first pulled up the screen, it dazzled me. It’s like…if you hadn’t done the bodice in black, it could’ve turned out all wrong. Or if one of the colors on the skirt was a shade different, the mood would totally flip out. I love it! I have a suggestion though. i noticed, in the past that you made soem Naruto costumes, could you make more? (its kinda strange i know! :) your amazing! That is seriously gorgeous. Maybe you should make a sun one, and a cloud one, or a rainy one…all sorts of weather :D.
I wish I had this dress to wear for my recital coming up… Absolutely magnificent! i think it’s great! It sorta reminds me of what a female version of the Sixth Doctor would wear to a fancy dress party. Oooooooo!!! I totally agree with you, Talia!!! It would be beautiful!!! And Liana!!! This dress is the best one yet!!! OH. MY. GOD. HOW ARE YOU THIS AWESOME! YOU ARE THE MOST AWESOME EVER! THIS DRESS IS LIKE IF RAINBOW BRITE WENT TO A BALL IN RAINBOW LAND!!! THIS DRESS (AND LIANA OF COURSE) ARE TOTALLY EPIC!!!! How much is this? I want it! just what I was looking for just can’t have the black bodice.